The past months saw two unusual bouts of winter (the ‘Beast from the East’ had its way with our garden, too), each accompanied by very heavy snowfalls. 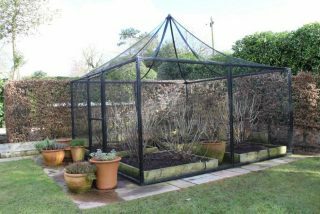 Our plants and garden features were as bowled over as we were: Not only did trees and shrubs suffer substantial branch-loss; the roof of our largest wrought iron fruit cage collapsed because the metal struts could not bear the weight of the snow! 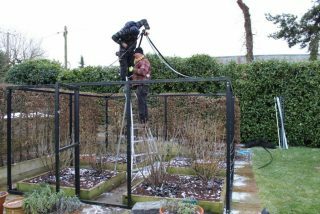 To prevent recurring recurrence during the next arctic spell, we decided to double the number of roof struts in the largest cage. Carrying out this task required special craftsmanship which we found at J.W and A.J Barrett Ltd. in Bromsgrove. 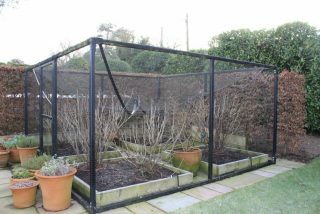 While we were at it, we also replaced the netting on the sides of the fruit cages which, in contrast to the manufacturer’s specification, had proved not to be resistant to squirrel attacks. 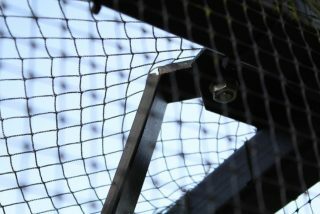 The sides are now made from wire netting, which will prevent further raids on our precious strawberries!